We have a wonderful range of well over 200 Crystal & Gem Essences, from Abalone, through Emerald, Gold, Lapis Lazuli, Ruby & Zoisite. We have a wonderful range of well over 200 Crystal & Gem Essences, including our Gem & Crystal Essence Collection set, each hand made with love and care and at stock level. 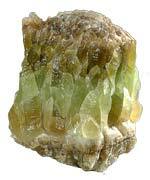 The mineral kingdom, like all kingdoms of life on our planet, carries consciousness and contributes its unique gifts to the development of the Divine Plan for Earth. Over the ages the energies of minerals, which include crystals and gemstones, have been used in almost every ancient civilization on Earth as tools for transformation and the expansion of consciousness. One very common and effective way of using the energies of specific crystals and gems for transformation is to make them into essences. In this process the energetic patterning of a gem or crystal is transferred into water, which can then be easily absorbed by the bodies subtle energy systems. Vibrational essences made from the mineral kingdom have different qualities than those made from the flowers of the plant kingdom. Flower essences contain the life force and a particular pattern of consciousness. They are ethereal in their nature and work by stimulating a change in consciousness, which then gradually filters down to the etheric blueprint. Essences made from gems, crystals and minerals often carry an energetic resonance that will remind our etheric patterning how to be in balance and healthy. There are also many essences in this group that have the unique ability to trigger the etheric memory of our energetic blueprint, helping us to remember how to use light. Currently many people’s energy systems struggle to hold enough light and this is one of the major reasons why re-balancing can take a long time. The information provided here comes from our own intuitive research gained from more than 15 years of working with these essences as well as other sources; most notably Gem Essences and Vibrational Healing by Gurudas and Crystal CoCreators by Dorothy Roeder. 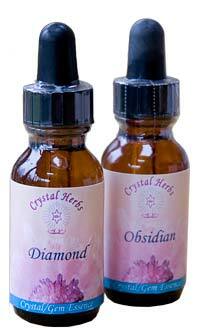 Crystal Herbs single Gem & Crystal Essences are made by the sun method of potentisation, with the loving help of the Nature Kingdom and the Angelic and Ascended Realms. Each of our Gem & Crystal Essences are prepared as stock level essences, and we recommend that you take them directly from the bottle rather than dilute them further, in this way you will gain maximum benefit from their vibrational frequencies. Preserved in Organic Brandy. These Essences can be combined by mixing equal quantities of two, three, four or five stock essences in a clean 25ml bottle. Alternatively we can make stock level combinations of Gem & Crystal Essences for individual needs (25ml size only, max 6 essences). Single Gem & Crystal Essences may also be purchased as a self selected set of ten essences in a card box (10ml or 25ml size). Take 4 drops on the tongue from your chosen Essence/ combination between 2 & 4 x a day, continuing until the bottle is finished. For best results take straight from the stock bottle sent, do not dilute. Preferably take 10 minutes away from food and drink. If you need any help or advice with choosing or using these Gem & Crystal Essences, please see our Choosing An Essence page or you are most welcome to contact us if you would like to speak to someone.